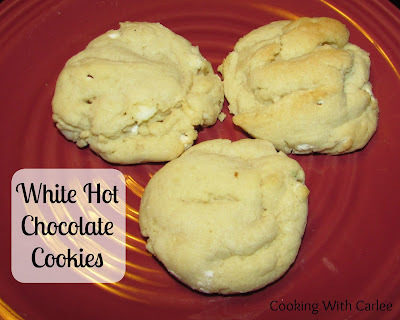 This is another recipe inspired by the hot chocolate mixes that we made and shared during hot chocolate week here on the blog. To say I had fun coming up with recipes to use the mixes in might be a bit of an understatement, but everybody sure enjoyed trying the new treats. Whisk together the flour, white hot chocolate mix, salt and baking soda. Cream the butter and sugars until light and fluffy. Add the eggs one at a time mixing thoroughly. Add the vanilla and beat for another minute. Slowly add the flour mixture and stir until completely combined. 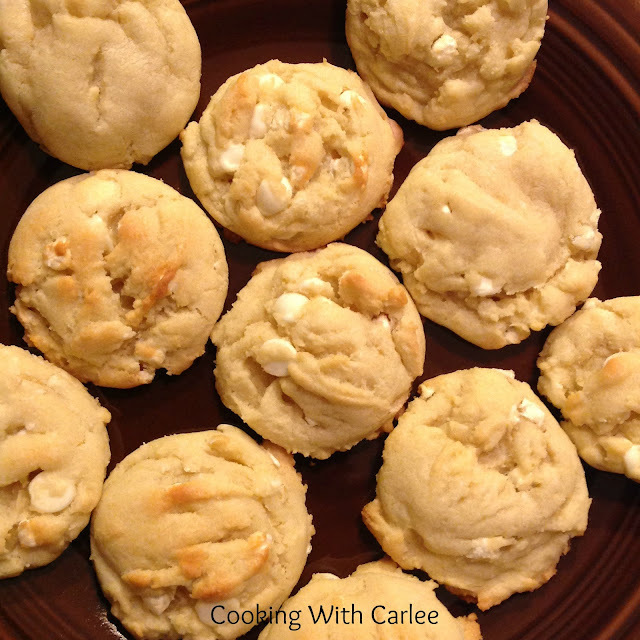 Stir in the white chocolate chips and marshmallow bits. Drop by tablespoon onto cookie sheet and bake in preheated oven for about 8 minutes. What perfect little cookies for a cold day! This and some hot chocolate and a fire and a blanket are about all I need (plus my favorite little snugglers). Can't wait to try these out! That does sound like a perfect way to spend a cold day! I hope you love them! ooo cool idea! I have a jar of those marshmallow bits I've needed to use up forever. I loved your banana cake recipe. I'll have a post up hopefully soon for it. :) I love having a blogging bud to exchange recipes with. Oh yay! I am so glad you liked it! I can't wait to see the post! It is fun trying each other's stuff. You have been loading up my to-make list lately!